ARLINGTON — The latest Silver Line concrete issues face a test from the weather this weekend, but the man overseeing construction still expects the line will open to riders before the end of 2020. “Mid-2020 is when we realistically expect to open,” the Metropolitan Washington Airports Authority’s Charles Stark told WTOP Wednesday. Metro General Manager Paul Wiedefeld said last month he expected the line to open no earlier than mid-2020, and possibly later than mid-2020. 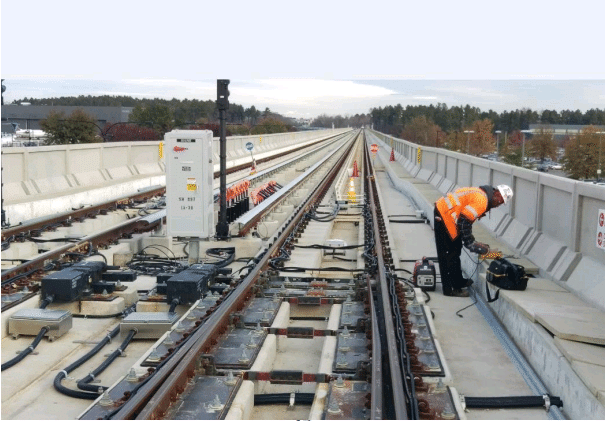 For the first phase, Metro did months of testing and training after construction was complete but before opening the line to riders. The latest problems for construction include cracks in concrete at the new rail yard near Dulles Airport. The cracks are separate from previous problems with concrete panels at stations. An example of the crack monitors the Airports Authority has placed to test the stress caused by cold weather. 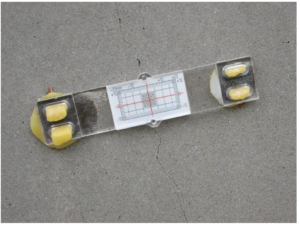 “It’s thought to be a contraction of the concrete panels in the colder weather, colder nights, and so we have put crack monitors on some of those cracks to see if the stress caused by the shrinkage in cold weather, if the cracking has stopped,” Stark said. Answers are likely soon, since the concrete faces a significant test this weekend with wild temperature swings, including a forecast drop into the single digits Sunday night into Monday. If cracking has stopped, the contractor building the rail yard would fill and seal the cracks to keep water from getting inside, Stark said. “If it hasn’t stopped, quite frankly 7 degrees is probably near the limit of what we would see at this latitude in the United States, it may modify the approach that they take to mitigating those cracks,” Stark added. Any plan for fixes would have to be approved by both the Airports Authority and Metro. Stark does not expect it to add to delays for opening of the rail line. Other ongoing work or recently settled changes include $1.2 million in Automatic Train Control fixes meant to address issues found in Phase 1 of the Silver Line that opened in 2014, adjustments for different ground conditions along the Dulles Greenway, and an additional $10 million toward project management support to oversee contractors. The final tracks are being laid, stations are shaping up, plans for final turnover of the project to Metro are being developed, and work is being done inside buildings in the rail yard. One additional hiccup is halted railcar maintenance lift installation due to a lack of parts. The owner of the subcontractor manufacturing the lifts died unexpectedly, and the company put production on hold. It is unclear when those parts will be available. There is still an additional punch list of rail yard items that must be completed before testing can ramp up.